Hire Immigrants Ottawa (HIO) hosted employers, senior executives from public-and-private sector organizations, representatives from immigrant serving agencies and stakeholders at the annual Employer Council of Champions Summit (ECC) – Diverse Talent is the New Competitive Edge: Attract, Develop and Retain. The two-day event featured a Learning Exchange, a networking event and the Employer Excellence Awards ceremony. Speakers provided employers with insights into the importance of hiring and integrating skilled immigrants into their workplace, in order to remain competitive in today’s marketplace. Employers also heard first-hand accounts of effective and forward-leaning workforce integration initiatives, such as mentoring programs and internships for skilled immigrants. Glen Hodgson, Senior Vice-President and Chief Economist for the Conference Board of Canada delivered the keynote address on the Relevance of Immigration to Canada’s Economy. 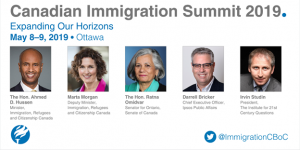 He underscored the increasing role that immigration will play in Canada’s economic growth, the need to recognize the importance of skills-based immigration to address labour market needs and immigrants’ potential for long-term economic contribution. In light of Canada’s increasing reliance on the immigration of skilled workers as the source of labour force growth, Mr. Hodgson suggested that Canadian employers will need to reconsider their tendency to require Canadian work experience. The integration of skilled immigrants into workplaces is becoming increasingly important as slowing labour force growth is reaching a critical stage with the first of the baby boomers, some 344,000 people, reaching the age of 65 this year. With their pending retirement, many employers will feel the effects of a tightening labour market. Intensifying the changes that an aging population will drive in the labour force are the effects of declining birthrates and decreasing numbers of post-secondary graduates. “We must keep in mind that we are competing in this war for talent, not only with other communities in Canada, but increasingly with growing cities in other industrialized countries and emerging economies,” said Hicham Adra, Senior Vice President and General Manager, National Capital Region, CGI. 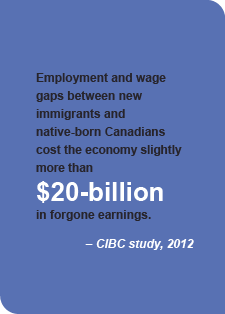 Canada’s population is becoming increasingly diverse. According to Statistics Canada’s latest projections, by 2031, more than 25% of Canadian residents would be foreign-born—the highest proportion since confederation. Along with significant international work experience, more than 60% of these immigrants will have some type of post-secondary education—the proportion is even higher for working-age immigrants. “Employers are already experiencing a shortage of skilled talent in several sectors in the Ottawa area. But this latest demographic shift will place even more pressure on employers as they try to fill senior positions with the best candidates,” said Rosemarie T. Leclair, past President and CEO, Hydro Ottawa Group of Companies. Employers were encouraged to take a number of measures to position their workplaces to stay competitive in a changing labour market. 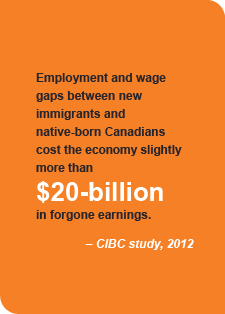 The following are resources and programs that employers can make use of: www.hireimmigrantsottawa.ca; Cross Cultural Competency Workshops, Coaching, and Networking events delivered by Hire Immigrants Ottawa; use the services of the Ottawa Job Match Network to access the skilled immigrant labour pool; and participate in mentoring and internship programs.